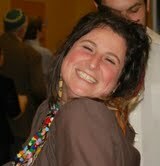 Lisa Bodziner (Cohort 7) taught 6th-12th grade for three years at the San Diego Jewish Academy, and then worked as an experiential educator at the Pearlstone Center in Reistertown, MD for two years. She currently resides in Baltimore, is the Director of Educational Engagement at the city's Center for Jewish Education and teaches 2nd-grade Sunday School. My name is Lisa Bodziner, and it is truly an honor to be writing for the Pardes hevre. During my first week of teaching 6th-12th grade at the San Diego Jewish Academy, a sixth-grade boy screamed, “I have to use the bathroom. Can I get out of here? !” out loud while I was giving over what I considered to be the most profound Rashi I had learned at Pardes. Needless to say, this student won my adoration, after three years. We can all relate, those who are novice educators and those who are masters. If you want to be good, you will always have those first moments, that first week, possibly that first year, of terror and questioning. How am I going to get through this? Did I make the right decision? Why did I leave Israel? I would say it took me until winter break of my first year to stop waking up in the middle of the night with nightmares about 6th-grade boys. I wrote curriculum and taught 6th-12th grade students in California for three years, and yes, Surf PE was an elective. I led tefilah, wrote for the Pardes Educators blog, tutored students for their Bar/Bat Mitzvahs, taught scribal classes and organized a Habitat for Humanity trip to New Orleans for the junior class. I loved teaching. I loved the classroom and my students. No matter what mood I was in when I walked through the door, they had a way of lifting me, and I like to think that this was mutual. Yes, I FELL for teaching. What have I learned about becoming an educator? Too much to share in 500 words. Always ask for help. Use the mentors and resources around you. Call Susan. Be daring, everyone is looking. Be yourself; students smell phoniness. Creative thinking and authentic connection is crucial to building community in the classroom. Having favorites will soon teach you to not have favorites. Be open to the children you think will be the most problematic, and learn WITH them. Surprise them. It is very worthwhile to have friends on campus. Oh yes, and change your walls and seating configurations more often than not. Young people, like us, are challenged by change. Upon fulfilling my teaching commitment, I chose to move back to the East Coast. I settled in Reisterstown, MD, have worked for the Pearlstone Center for the past two years and miss my students every day. I developed my skills as an experiential educator. Yes, milking a goat, making cheese and teaching about Shavuot in a lesson plan is very powerful. The outdoors became the classroom and I taught all ages, all walks of life, families, grandparents, college-age students, early childhood, middle school, teachers - the full megilah. I began running environmental experiential conferences for the Pearlstone Center, merging the farm with the retreat center, and after two years, I missed the classroom, as Susan always said I would. Currently, I am still in Baltimore. I teach second grade Sunday school once a week to adorable children who challenge and stretch me. I am also the Director of Educational Engagement at the city’s CJE (Center for Jewish Education). I enjoy Jewish life in Baltimore immensely, and (with the exception of my gratitude to my parents) have always been most grateful for the four fruitful, incredible, spiritual and informative years I spent at Pardes learning Torah. May this year be the brightest year yet. Come visit Baltimore. I will show you what great fun it is. And there are plenty of kosher restaurants.